Ah love. When it first strikes the object of our affection it is so wonderful. You could sit and listen to them prattle away for hours and hours. Nothing made you happier. But sooner or later that phase of love ends, and from time to time that wonderful person whom you love just needs to shut up because everything they say and think is wrong. We all argue that is natural. But what isn’t natural is losing. No one wants to lose an argument. If you take these steps to heart I promise that you will greatly increase your chances of winning your next argument. If you keep the argument to the problem at hand, taking turns bringing up point and counterpoint, you run the risk of losing. It is possible that your point is the weaker of the two. Therefore don’t argue about ‘facts’ or ‘issues’. Make the argument personal. The problem isn’t that they arrived late. The problem is that they are inconsiderate about your wants and needs. Likewise the problem isn’t about them leaving their socks on the floor. The problem is they don’t care about you. Remember they might have good reasons for being late or leaving their socks on the floor, but they can never have good reasons for denying your needs and being uncaring. When you are arguing, your goal is to build a rock solid case that they are at fault. That can be tricky when you deal with specifics. For example; after a long day it might be perfectly reasonable that they forgot to stop at the store and pick up milk like you asked. So instead of focusing on the traffic, the phone call they got before they left, or the big project they are working on, focus on all of the previous times in your relationship that you asked them to do something and they let you down. Remind them of the time they forgot to wake you up earlier like you asked them to, and that time they canceled plans because someone in their office came down with the flu, and that time when you tried to call them to get a lift but you couldn’t get a hold of them. If you can’t think of enough examples you may want to toss around the words ‘always’ and ‘never’ a lot. As in you always forget to do what I ask, and you never listen to me when I ask you to do something. Sometimes you can win an argument by yelling. But the better strategy is to settle in for a long quiet fight. During this type of fight you want to answer questions as curt and abrupt as possible. Likewise you may want to engage in some exaggerated behaviour such as turning the pages of a book with extra force, scrubbing pots and pans vigorously, closing cupboards louder than normal and so on. This is also an excellent time to channel your inner teenage girl and scoff and roll your eyes after they do or say anything. I find anger comes in three stages; first you start of really angry or annoyed. Second you think about it for a while and you calm down enough to the point where you could probably see their side of things. And lastly you stew silently about it until you are ready to explode. You stand your best chances of winning the argument if you bring up your concern during stage one or three. You are just too soft and reasonable during stage two to guarantee a win. One of the sure signs that you will lose an argument is your willingness to admit you might be partly at fault too. Once you stop and think of the mistakes that you made, it is much, much harder to see the other person as totally in the wrong. You have to be steadfast in your confidence. They are the one at fault, they are the one who made the mistake and you are simply the victim of their thoughtlessness. 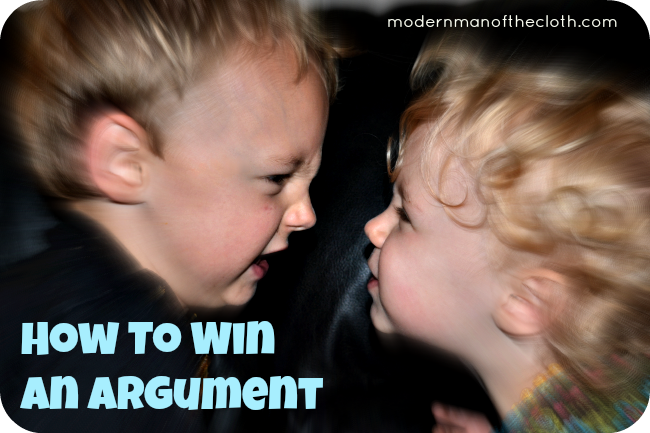 These tips will help you to win arguments. But I feel it is important to warn you that no one like to lose all the time. If you follow these tips too often, or too well you may will win too many arguments. If that happens your partner now seeing how thoughtless, mean, inconsiderate they so often are may decide to pick up their marbles and go home. Which depending on your goals may be your ultimate victory, or your greatest defeat. Well I try. I am glad I gave you a laugh. I know what you mean. I just had to think about the worst fights I ever fought and write down what I did.